I have a two acre flower farm its called Floret about an hour north of Seattle. What we’re known for is squeezing a ton of flowers into a really tiny space and we grow more like 4-5 acres in our two small little acres here. Alright, well were probably excited to hear about how your pulling that off! How did you learn how to garden organically was your dad that way? So do you want to tell us how you got flowers? I delivered a bundle of sweet peas a $5 jar of flowers to this woman and I handed them to her and she smelled them and she just started bawling and telling me all these memories and I had childhood memories associated with sweet peas and then I started crying … right there standing on her doorstep and we’re both bawling and I knew this is what I am supposed to do! So my next question is then how did find your market if your kind of far from town…. where do you see things and how did you get that part? What To Do With Flowers? The first couple of years, it was figuring out what do I want to with flowers? Did I want to do weddings? I was interviewing this woman for a farming article I was writing she was talking about being the face of my business. So where do you sell them then at florists or farmer’s markets or I thought you sold to a CSA? they go a ton of places I would say natural grocery foods like whole foods have been our biggest customers from day one. daffodils just poking out of the soil…. So is it true your husband takes most of the pictures? we don’t use any special stuff we don’t to a ton of editing… occasionally we have clone out a blue port-o-potty out in the background because they’re so annoying and ugly ~ we ask the berry picking guys please move that…. it does’ it goes on forever… the berry fields behind us there’s rows and rows and … a lot of people thing they’re ours but it’s just the farms around us… we’re this little postage farm in the middle of all these gigantic farms all around us. all of my favorite cut varieties mentioned in the book…. growing out some other varieties … dip our toe into that world…. We have our own seed line …. to gather information and make it available for others…. and that just makes it worse? that’s like an average dahlia harvest during peak season…. OM Goodness… in your little two acres? So I always try to get my sunflowers in by April 22nd by Earth Day…When do you start? IDK my husband makes weeding seem so easy… he’s usually on top of it, I feel like we don’t get a lot of weeds at our place… where do you get the most weeds? Between your rows??? But weeds are a constant problem because everything is so moist everything wants to grow…. I usually ask about a favorite recipe you like to cook from the garden, IDK do you have a favorite flower arrangement?? most people who don’t even notice flowers but when you have the unripe raspberries that is a great conversation starter…. 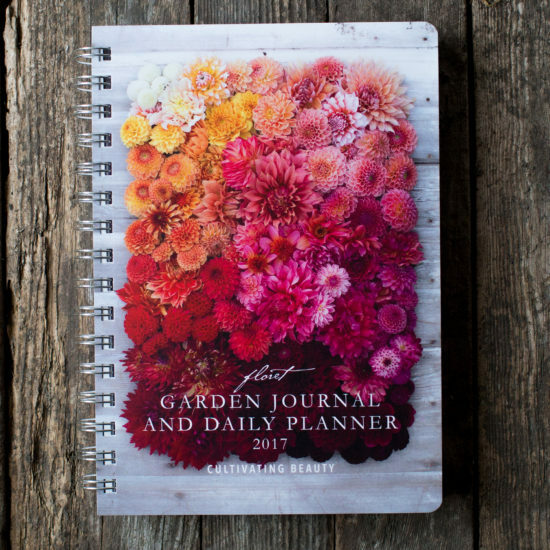 Speaking of resources I saw on your website you have that gorgeous garden journal is that new this year too? What a year for you! A favorite reading material-book, mag etc you can recommend? most successful are the ones that share their story…. IDK I was born in 1980. Another Rockstar Millennial! The Millennial I get to interview are the best! My step-daughter was born in 1980 and she’s one of the hardest working people I ever met both of my step-daughters are and they both are amazing hard workers! 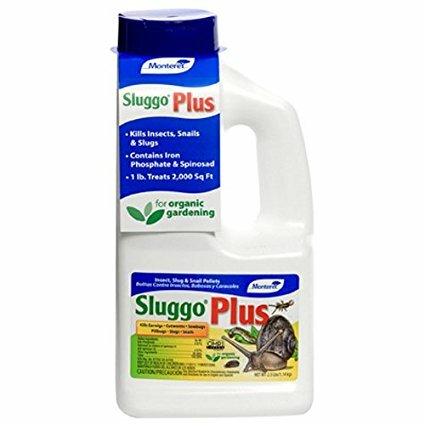 stop using chemicals in your soil! an environment for your grand children! That was beautiful …. That’s a big part of my husband and my mission is to help people grow their own little organic oasis, he worries so much bout is there gonna be a planet for our future generations… I feel like I am blessed because I get to talk with my guests and listeners I ‘m a little more optimistic…. I just think that is perfect! Thanks so much for coming on and sharing your journey and being so eloquent! hopefully there’s something there you can learn! 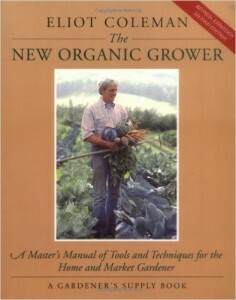 If you would like a chance to win a copy of Erin’s Book just enter a comment with your favorite take-away from this episode or a kind word for Erin in the show notes page on the Organic Gardener Podcast Page and then make sure you sign up for our email list so when I announce the winner you’re notified that your comment won!Contest Ends March 21, 2017! What a lovely book and podcast! As a amateur garden and flower connoisseur, I’d love to learn from you! Thanks for listening Mom! Always good to know your mom is in the audience! I’m so glad you enjoyed Erin’s interview Linda! Thanks for listening and let me know if there’s anything else you’d like to learn! See you in the Facebook group! I’m so glad you got so many golden sees from Erin’s interview. I love the dipping our toe in the world quote too! I’m glad your thinking of trying lavender! I’d love to hear how it goes. I thought about making our challenge for 2017 to try and take something to market. Just one product. It sounds like you might be interested in that kind of challenge! Thanks for listening! Thanks for introducing me to Floret Dacia! 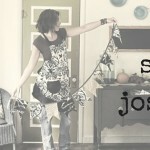 I’m so glad I found her blog when you first told me about them ordering some of your lovely aprons! Beautiful book and great show. Love Erin’s enthusiasm and down to earth approach. Favorite take-away? Never cut corners, and her daughter’s name – Olora! Thank you, Erin, for showing how beautiful growing organically can be! 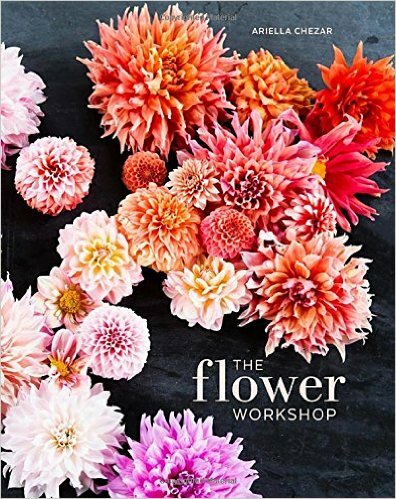 I’m so excited about this book as I love growing flowers! At least a year ago, I actually ripped out the pages of a magazine article about your farm because they were so beautiful, I couldn’t bear to throw them away. I can’t wait to see more in the book. Congratulations! I know Jess! Amazon said my copies shipped yesterday I can’t wait! There gardens are absolutely gorgeous. I hope to get to go there and paint someday! Oh my gosh I am so excited about this interview!!!!! I am totally inspired by Erin’s work. 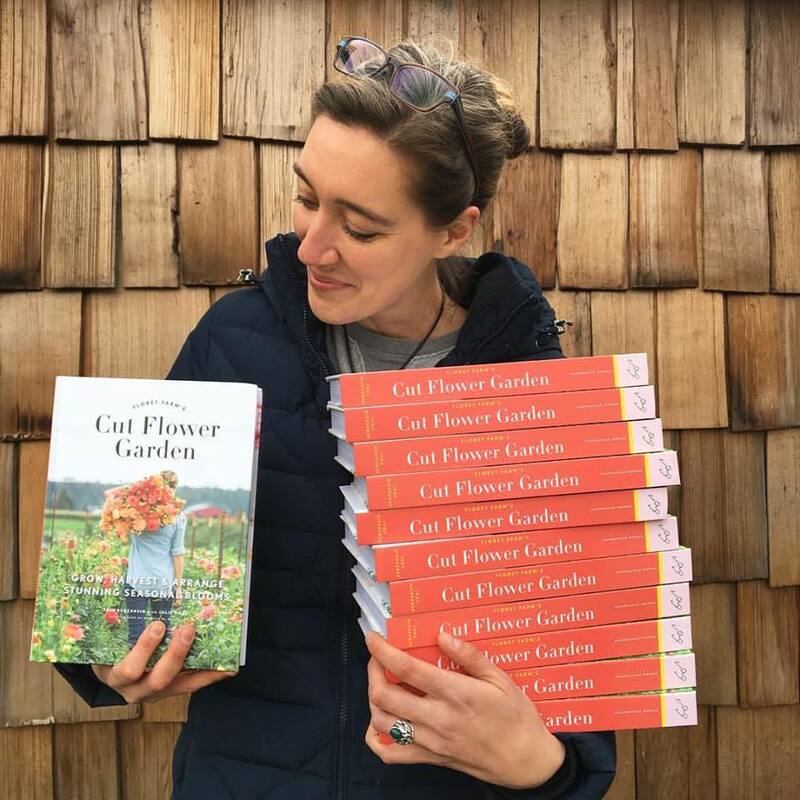 She is trailblazing the idea of growing show stopping flowers locally and organically and I personally know many women who decided to follow their dreams and become local flower farmers because of Floret. I love growing dahlias in my suburban garden, and the pictures in this book are absolutely amazing! Thank you Jackie for featuring Floret Flowers on your podcast! Thanks Basia!!! I was excited to try dahlias this year too after this interview. I don’t think we have them at our house? I was so honored to have her share her story with me. Thanks for listening and being one of those awesome inspiring guests yourself! For the free book – I liked that she is growing sweet peas to keep their variety going and to have other sources for sweet peas. And I liked her story about growing sweet peas and when she gave them to someone they cried with joy. I know isn’t that so sweet that they are growing sweet peas and taking over the seed saving so they don’t become extinct. It always goes to show that there are more ways to make money then just selling the plain blooms. In the flower Farmer Facebook group someone asked if you could really make money having a flower business and there were 185 encouraging comments! I can’t wait to read them all! I’m just so inspired!! I want to see pictures of everything she grows. I was so inspired when I listened that I’ve since planted lots of calendula, lavender and Mexican sage in and around all of my vegetable beds!! The chickens love the buds & petals & dried lavender hanging in their coop!! So many uses besides the awesome beauty. Thanks for another great podcast!! Wow Tammy! That’s amazing you did all that already! Great to hear the use of herbs with the chickens! I’ll love that it’s beautiful and functional! Love Erin! She is so inspiring and knowledgeable. I was surprised to learn she’s only three years older than me, because I see her as so wise. Thanks for the great interview! April I’m so glad you enjoyed this episode! She does seem wise for her years doesn’t she? Thanks for listening! Love love this episode of your podcast. thank you so much for interviewing Erin. I learned so much about flower gardens and am “almost” convinced to try a small area of flowers to sell in our metro area! Erin is so very inspiring. Ah Vicki! I’m so glad you were inspired. I was thinking I should make this years challenge to just take one thing to market or at least shop at your local market and go each week. That might be something you are interested in. You might also enjoy my interviews with Jaan Martin Fortier and Pamela Lund! Both talk about the farmer’s market, Pam from a newbee standpoint and Jean Martin from a seasoned professional’s view. Thanks so much for listening! My father and I started a garden when I was 7 and it was always one of the most important thing in my life. When I started dating my high school sweetheart in college, I developed a love for organic cut flowers from the local farmers market. Although we still live in an apartment, I’ve found a way to grow vegetables and cut flowers in our community garden. I LOVE how you never gave up on your passion. 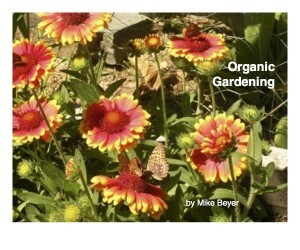 People like you will be the main drivers of the future of organic gardening. Thank you for your podcast and I can’t wait to buy your book! 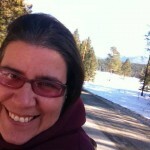 I LOVE Floret Farms & Erin .. what a great podcast! I would LOVE to WIN her book!! I AM SO INSPIRED !! This has been thoughts going about in my head…… I would love to have fresh flowers to put in the house…….I admire the flowers in a store yet I will not buy them…. wow what kind to grow, oh dear, what do I do HELP……..three years ago I was working a vegetable farm and the head gardener planted these flowers , it was my first experience something other than marigolds, and the beauty awed me as walked into the garden ……… I want to create that again to share with others that come to my garden………..where do I start……which ones to grow…..please don’t let this be something I end up not doing because of lack of info and end up not doing. 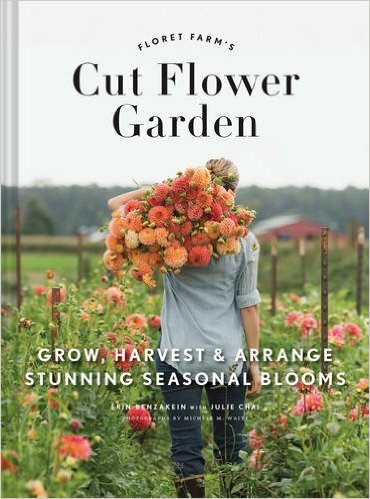 Erin’s book will be my guide for my first step into growing flowers. Another HUGE INSPIRATION is she does not use chemicals, neither do I. Thank you for sharing your story. You have come into my life answering so many questions and giving me confidence . Love the collecting of seeds. I WANNA LEARN !!! Wow Emily, I’m so glad you listened to my interview with Erin and were inspired! And glad you don’t use chemicals either … Keep on being inspired and I think you will learn a lot as I have several interviews coming up that really help you learn how to build your soil so your flowers will grow more beautiful and beneficial insects will be invited to help keep your vegetables producing more and keep the bad bugs at bay. Thanks again for listening and please let me know if there is anything else you would like to learn. If you are on Facebook I encourage you to join the Flower Farmer group as well as our Organic Gardener Podcast group we’d love to have you join! Have a great day! Thank you… Really enjoyed this..
DROP THE CHEMICALS!! YES! My favorite part by far. If more people would go organic our world would be a much better place. Also the coming to terms with killing plants is good advice. No one is perfect right out of the gate. Just don’t get discouraged. I would love to read the book. I appreciate Erin’s sharing what worked for them and what didn’t. It helps to hear (read) someone talking about the initial dream compared to the sustainable reality. Thank you! I love how she grows so much on 2 acres .. inspired me to not give up on my tiny 3 acres as I start my first year growing! Your podcasts are great! Thanks! It was great to have a guest from the PNW! Being in Portland OR, the weather and conditions are similar and relatable. Erin’s story is great – I love to hear folks stories about why they are in their business, what drives them and there experiences and learnings! I love that you asked for a garden plot each year as a kid, I guess you new what you wanted at an early age! The layout of the book looks great from start to finish and I love when books follow and guide you through the year/seasons! Your website is great and informative; I will be perusing your seeds to purchase. Thanks you both for a very informative and fun podcast, it was enjoyable to listen to! I liked the use of other greenery (beans) , herbs, etc. – pea tendrils are really cool in arrangements! So, I’m really obsessed with Lara Casey, and she also featured Erin’s new book. 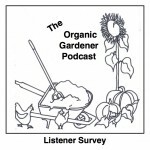 This is also the first year that we are planting our very own garden, and I’m going all organic, so I’ve been thrilled that there is a podcast such as this that exists. (This is my first comment here!). I’m a sucker for beautiful photography and this book has that, I’m also thrilled that it encompasses all skill levels. I enjoyed this episode, especially the part about not cutting corners. I am so excited to plant my first garden, so much so that, I don’t want to take the time to really plan! I needed to hear this and not jump the guns. I WOULD LOVE TO WIN THIS THIS BOOK-I LOVED THIS EPISODE SO INSPIRING,I TOOK AWAY These 2 COMMENTS ALONG WITH MANY OTHERS. #1″One of my favorite things to do is to incorporate food into bouquets-I NEVER THOUGHT ABOUT DOING THIS!! !-wow such a cool thing to do. It was reassuring to know that even someone as successful as she is ,has made mistakes along the way AND ONE NEEDS TO ACCEPT THAT AND KEEP GOING. Thank you Jackie for this great interview and resource.I would love to read THIS BOOK.Congratulations to ERIN FOR PUBLISHING SUCH A REALLY GREAT BOOK.